Goa is land of fabulous outing spots where there are plenty of scenes that give ultimate enjoy to the visit. It is a land of enjoy and popular for beautiful beaches and open culture. Tourists from all corner of world come here for enjoying the sea and sun bath. Holidaytravel.co manages all the tour related tasks for those who love to prefer to spend holiday during peak season. It is good to have a great chance to visit during the month of October, November, December to the most amazing culture of Goa during the festival. In this tour package you will cover Calangute Beach, Anjuna Beach and Baga beach, Basilica de Bom Jesus church, Dona Paula and Miramar beach. Being a part of Goa during this time of the year will surely make your Festival the most cherished one of your life. Goa is among those enthralling tourists destinations that you can visit any time of the year and visiting Goa during peak months is something gaining a unique experience that you will remember for lifetime. We have more than one reason why you should visit Goa during the peak months, especially in October, November, December there are many festival which takes part in this month and tourist mostly visit to enjoy the festival in Goa which are Dushhera, Diwali, Christmas and new year celebration. During this festival tourist attracts to visit Goa and enjoy with the culture of Goa. Goa became overcrowded in this months and there is special arrangements of parties done for the tourist. Visit Goa in October: Peak season starts from October there are holiday in October for Gandhi Jayanti and Dushhera so most of the tourist come from the whole world to enjoy holiday in Goa and spend some time in Goa. Visit Goa in November: Goa became over crowded during Diwali as most of the Indian tourist come to celebrate the festival of Light Diwali with their families. People come here to enjoy the atmosphere of goa which is pollution free during diwali season also. Visit Goa in December: Month of December is quite special. It’s perfect time to be in Goa for many reasons. From sunbathing to water sports and beach parties to musical events, everything happens in the month of December. Moreover, you will not find a better place than Goa to celebrate Christmas & New year. Tourists from all across India visit Goa to celebrate Christmas and new year holidays. Note: Above package rates will not applicable during New Year, Christmas, Diwali or any National Holiday. We can also arrange Villa and Apartment. 3 nights accommodation in well funished AC room. One Day south goa Sightseeing tour with 1 hour Cruise Ride on Mandovi River. Free usage of Swimming pool ( with proper swimming costumes ), Gym. Tea / Coffee maker in room ( replenished once daily). Calangute Streets for a Shopping Ride: Soul-warming sun, plenty of white sand, palm trees, crystal clear blue water, and fragrant sea air is what Calangute beach is all about.The Beatles who used to come to Calangute in the late sixties to rest and enjoy beach life, this luscious stretch of silvery sand is considered as Goa’s most beautiful and The Queen of all beaches An ultimate destination to spend the most exquisite experience of one’s life. Panjim City & the Church: Panaji means “land that never floods”. It has terraced hills, concrete buildings with balconies, red-tiled roofs, churches, and a riverside promenade. There are avenues lined with gulmohar, acacia and other trees. The Baroque Our Lady of the Immaculate Conception Church is located overlooking the main square known as Praça da Igreja. Pretty villas, cobbled streets and interesting buildings give Panaji a Portuguese ambience. The official name is Panaji. The Portuguese name was Pangim. The city is called Panjim in English. The city is called ponnjé in Konkani. Panjim City at Sunset. Panjim is the capital of the Indian state of Goa and the headquarters ofNorth Goa district. It lies on the banks of the Mandovi River estuary in Tiswadi taluka. Water Activity in Goa: Water sports are a great way to enjoy the beauty of beaches in India and to discover the underwater life of the ocean. Goa is one of the best beach destinations in India that offers some of the most thrilling water sports like para-sailing, sunset cruises, snorkeling and diving, kayaking, scuba-diving, windsurfing, water skiing, etc. The heart-pumping water adventure like scuba diving, wind surfing, and water ski are the best alternative to the mountain adventure for everyone looking for some thrill in their life.With endless options for water adventure activities across its vast coastlines, ‘Goa’ gives you an ideal holiday experience while offering some of the daring water sports like scuba-diving. The fabulous golden coasts of Goa stay open throughout the year. After the sun dies down and the stars take up the sky, Goa nightlife begins. As much as the city is known for its beaches, local rave parties attract equal attention. Beach shacks or small beach joints are more popular in Goa rather than expensive restaurants and pubs. Most of these shacks serve alcohol (specially chilled beer) along with the other nutties and are open until late in the night. During Monsoons, Mambo's and Tito's at Baga Beach both rock all year round. The bar at The Park Hotel in Calangute is alao jam packed. Live musicians are running at back Cavala, near Baga Beach offering live retro and rock on Friday nights and retro, jive, and salsa on Saturday nights. In fact, legendary nightclubs in Goa such as Club Cubana, Cafe Mambo, and Tito's have even become part of the sightseeing itinerary to an extent. Goa by Air: If you are coming to Goa by airways then the nearest international airport is located at Dabolim. Dabolim main airport is situated at a distance of almost 29 kilometers away from Panaji. This international airport is well connected with the major domestic cities as well as international major cities in U.K. and Germany as well. Goa by railways: it is quite easy to reach Goa as the major railway stations in Goa are located in Margao. The main railway station is known as Madgaon and Vasco-da-gama. These railway stations are well linked with Mumbai and then other major parts of the country as well. There is a lot more than just the wonderful golden beaches lined up with swaying palm trees, the sparkling blue strip of ocean that runs parallel to the yellow sands and the colorful friendly people , that adds to the vibrancy called ‘Goa’. The all year through joie de vivre of Goa, on the Western border of Indian subcontinent, is also attributed to the innumerable number of fairs and festivals in Goa, that gives the people here more reasons to celebrate. Baga Beach: Baga beach is for sure the most happening beach in Goa as it is Located in the northern side of Goa. Baga Beach stands amidst green hills and majestic Arabian Sea forming an eye-catching landscape. Catching fishes and spotting dolphins make up for an interesting pastime at the beach. The night life at Baga is even more exciting than its days. Baga Beach is the home to some of the hottest night clubs like Tito’s and Mambos which are always crowded with the dance freaks. 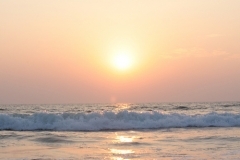 Calangute Beach: Also called the ‘Queen of beaches’, Calangute is the largest beach in north Goa. Calangute along with Candolim, Baga and Anjuna form part of the beach stretch extending from just outside Panaji city to Fort Aguada Calangute is Goa’s busiest and most commercialized beach town Its sand shelves steeply and could be risky for children. However, the beach is large enough to accommodate the thousands of tourists that visit during the high season. Anjuna Beach: The beach is famous for its stunning natural beauty with swaying palms trees and soft powered white sands. The beach is marked by an unusual rocky formation overlying a cove of white sand and black rock that juts out into the Sea. Anjuna Beach is also an ideal place for full-moon parties held especially during Christmas and New Year. Tourists love enjoying the blissful atmosphere of the luminous full-moon casting a spell and the soft foamy waves kissing their feet. Dona Paula: Dona Paula is a famous tourist destination and former village in the suburbs of Panaji, Goa. Initially called Oddavell, the villagers decided to rename the village as Dona Paula after Paula Amaral Antonio de Souto Maior, a historical figure in Portuguese India. She was the daughter of the Portuguese Viceroy of Jaffnapatnam, in Sri Lanka. She and her family arrived in Goa in 1644 and she married a Fidalgo from Spain in 1656. Dona Paula was a woman of charity and is known to have helped the villagers and worked a lot for their betterment.